This paper quantifies the mechanical properties perpendicular to the grain and in shear of glued rotary peeled veneers, as would be encountered in veneer-based structural products (i.e. 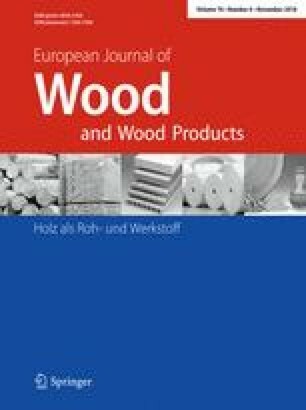 by including both the effects of hot pressing the veneers and the glue used during the manufacturing process), of three species recovered from juvenile (early to mid-rotation) subtropical hardwood plantation logs. This underutilised resource has currently little to no commercial value in Australia but proven potential to produce attractive veneer-based structural products. Determining these unknown properties is important as they constitute essential input data to ultimately predict the behaviour and design properties of veneer-based structural products in cost-effective numerical simulations. Two species planted for solid timber end-products (Gympie messmate—Eucalyptus cloeziana and spotted gum—Corymbia citriodora) and one species traditionally grown for pulpwood (southern blue gum—Eucalyptus globulus) are considered in the paper. The dynamic modulus of elasticity, compressive and tensile strengths perpendicular to the grain of veneer-based elements, each manufactured from single veneer sheets, were experimentally measured and are analysed herein. These properties are found to have no to weak correlation to the parent veneer sheet dynamic modulus of elasticity parallel to the grain, a value which is commonly measured in line to grade veneers. The shear modulus (in the longitudinal-tangential plane), also referred to as “modulus of rigidity”, through-the-thickness and rolling shear strengths were also experimentally measured, and the results are discussed in the paper. Little to no correlation to the veneer sheet dynamic modulus of elasticity parallel to the grain was found for these properties. Weibull distributions are fitted to all test results and presented to probabilistically consider the investigated properties in numerical simulations of veneer-based structural products. The online version of this article ( https://doi.org/10.1007/s00107-018-1350-8) contains supplementary material, which is available to authorized users. The authors would like to thank the Australian Research Council for its financial support through project DE140100212. The support provided by the Queensland Department of Agriculture and Fisheries (DAF) through the provision of the unique Salisbury Research Facility is also acknowledged. The authors also express their gratitude to the Forest Product Innovation team at the Salisbury Research Facility for their invaluable help in preparing the 3-ply LVL.